Over the past couple of decades, Phuket’s place among luxury destinations has teetered on the proverbial cliff. Walk through Patong and you’ll need more than two hands to count the number of tuk tuks, touts, and bar girls who proposition you. (You’d probably want your hands to fend off the more aggressive girls, too.) With the throngs of tourists today, it’s hard to imagine that Phuket was ever remote. Which is why it’s all the more impressive that the super-luxe Amanpuri, originally opened in 1987 and arguably one of the most splurge-worthy properties in town, continues to define luxury in Southeast Asia. 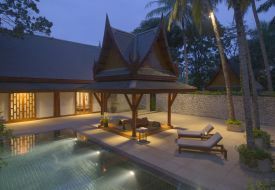 I recently stayed in one of Amanpuri’s three newly converted Pool Pavilions. It is the most opulent of any accommodations I have ever enjoyed, and that includes the overwater villa I stayed in during my honeymoon in Bora Bora. Like other accommodations at Amanpuri, the pavilions come with an outdoor sun deck and dining terrace. It is not an exaggeration to say that the outdoor space is larger than many Manhattan apartments. Each Pool Pavilion also comes with a private pool (8-10 meters long). Amanpuri has 40 pavilions overall, and each boasts a king-sized bed, large bathrooms with separate dressing areas (along with the standard bearer of luxury in Asia – a Toto washlet), and views of either the Andaman Sea or the property’s lush gardens. While not all pavilions offer complete privacy, they are spaced apart from each other enough that many guests will want to call for a buggy to bring them to the main resort facilities. Last, but not least, what makes Amanpuri the epitome of luxury is its staff, whose attentiveness and genuine care in ensuring each guest is satisfied puts the resort in select company. I look forward to one day returning to Amanpuri. If the past 25 years are any indication, I know what will await me. For general trip-planning information, see our Phuket destination guide.